I have a brilliant little giveaway for you all! 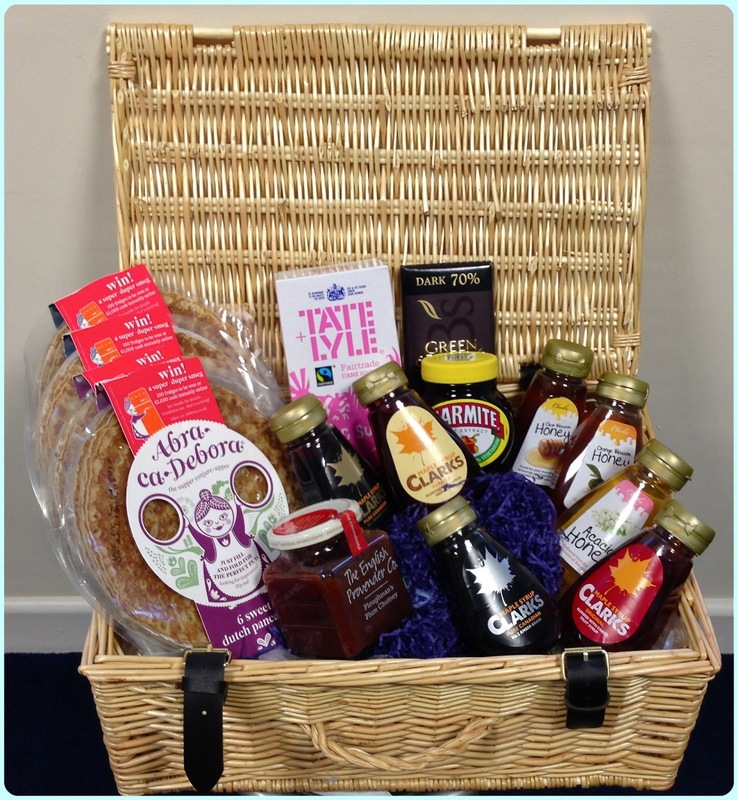 My friends at Clark's Maple Syrup have donated this wonderful Abra-ca-Debora Dutch Pancakes Hamper worth over £50. It's absolutely jam packed with goodies to make perfect pancakes! It includes ready made pancakes, a jar of chutney, a selection of Clark's maple syrups and honeys, chocolate, marmite and icing sugar. I reviewed some of Clark's syrup and honey a couple of weeks ago, and I can confirm they are fantastic! Just look how much is in it! I'm insanely jealous that I can't win this bad boy myself. Perhaps I could befriend the winner and persuade them to take me on a pancake picnic...? If not I hope whoever wins this fantastic prize makes a suitable pig of themselves. The competition runs from 19th April to 17th May 2013. Thanks once again to Clarks, and of course to the lovely people at Abra-ca-Debora for this great prize. Please feel free to pop over to both their Facebook and Twitter pages to say hello! The winner was Emma Shellum! Well done! I think the pancakes are my favourite? Following via GFC as Helen Moulden! I've never had maple syrup before so would love to try it! My favourite is the 70% Green & Blacks - closely followed by the honey. maple syrup all the way !! I love all they syrups....Yummy! the pancakes are my favourite! The Clarks Maple Syrup! I have a bottle stood in my fridge right now! I am the BIGGEST fan of all pancakes! I eat them as often as possible! Usually once a week! Sometimes I just have pancakes for dinner- I'm addicted! :) Love maple syrup! My big bro lives in Canada so sometimes he sends me the real Canadian stuff! Yummy ! I'm a bit obsessed with maple syrup so that's an easy one! The jar of Chutney is my favourite. My son would love the marmite, I would love the chocolate, and Hubster would love the maple syrup, so pancakes all round and one happy family!! Follow via Google as Wayne Smith! Honey - I love it ! Maple surple - used to live in Canada where you can't move for maple trees, they even use it in biscuits! Would like all the hamper though. The pancakes and the maple syrup looks delicious! Green and Black's chocolate, although everything looks yummy! oh its between the chocolate and maple syrup both are my fav on pancakes! The maple syrup looks lovely. I love anything on my pancakes, but maple syrup and cream is awesome. Not sure how well it would go with the pancakes but I want that Marmite! Haven't had any in ages! Either the Marmite or heck I will go for the pancakes! The maple syrup! Soooo good on so many puds! I have joined GFC as Ali Thorpe. It has to be the Marmite! Marmite - love that stuff. I love it all but my fave would have to be the the Abra-ca-debora Sweet Dutch Pancakes - the are delish! The pancakes! I absolutely love them and not had them for ages as Im always on a diet round pancake day! I love love love icing sugar. Whenever I make cakes with the kids I find myself having to top-up the icing as I keep eating it - oops! The plum chutney looks delicious. All the items are my favourite, heaven in a hamper. The honey, I love the stuff! Seems wrong to ask for the pancakes without the maple syrup & vice-versa! Mm mm! Pancakes and maplesyrup! I love maple syrup. Tastes great on so many things. The Green & Blacks chocolate with the pancakes. Ooh, plus a bit of maple syrup drizzled on top. I might as well just say all of it! Though hubby can have the marmite. Honey with the pancakes!!! nom noms! The Maple Syrup, is my favorite, with Marmite coming up a close 2nd.